For those who are unaware, I have autism. A mild case of Asperger’s Syndrome, to be exact, but it is autism nonetheless. I have grown up with a passionate love for film which I still have to this day (otherwise, I probably wouldn’t keep updating this website with endless reviews and previews! ), but also with a difficult understanding of the greater world around me, which often prevents me from communicating as effectively as other people do. I also consider myself to be very fortunate as I have also had the love and support of family and friends who have helped me along the way to becoming an able, independent-minded individual who, to this day, is relentlessly in love with the art of film and does everything they can to let people know the very best that cinema has to offer. It is important to know all of this before hearing my thoughts on Life, Animated, a new documentary about a young man named Owen Suskind who, like me, was diagnosed with autism at an early age and found it difficult to communicate with his family for a small amount of time. The parallels between Owen and myself are already strong, but what makes the connection so profound is that, also like myself, Owen was eventually able to find his voice through the power of film, specifically Disney films like The Little Mermaid, Aladdin and others. The film, directed by Roger Ross Williams, examines Owen’s incredible story through interviews with his family, including father Ron, mother Cornelia, brother Walter, and of course Owen himself, as well as fly-on-the-wall coverage of Owen as he approaches adulthood by doing many things from running a Disney club at his school to graduating to moving into his own apartment to even maintaining a relationship with a girl named Emily. Throughout, we learn more about Owen as a happy child until his sudden retreat within himself and eventual diagnosis of autism, about how he would start using lines of dialogue from films as a means to communicate (the line “just your voice” from The Little Mermaid, for example, is a major early breakthrough for the family, despite doctors’ insistence that it is just echolalia), and how he would begin to make sense of the world through these films better than any professional teacher could ever accomplish. There’s a wonderful scene where Ron describes how he used a puppet of Iago, the parrot from Aladdin, to ask young Owen a series of questions, and Owen was able to respond clearly to this puppet than he had done previously with his actual father. That scene, as well as countless others throughout the film, demonstrates Owen’s remarkable ability to use several examples from Disney’s vault of animated classics to communicate how he was feeling in a world that felt very un-Disney. A lot of people, whether or not they themselves are also on the autistic spectrum, can relate to these frustrations about how the real world works, especially when they are just children, but it is important to understand that people with autism can find this more difficult than assumed. We learn that as Owen was growing up, he was bullied at school by a couple of boys who said they were going to burn his house down; of course, to any other person this is just a childish threat, but since those with autism tend to take things far more seriously, he retreated into himself in response under the pretence that these boys would, in fact, burn his house down. As someone with autism, I fully understand how this thought process can work; when a young autistic person is faced with a mean threat such as that, especially when they’re just a child, it’s hard to know whether or not they actually mean what they say because they haven’t quite grasped the concept of emotional tactics just yet, therefore they are more than likely to take this threat very seriously and get upset by the very thought of it. I have gone through this sort of thing myself, and let me tell you right now that it was not easy to pick apart what these bullies were just saying as opposed to what they were actually going to do. So, as you can imagine, it was something that hit home for me pretty damn hard. But despite the setbacks, including the early communication barriers to a later case of heartbreak, not to mention the reassurance that life itself is far from similar to how it is in Disney’s universe, the film makes a strong point in how Owen’s life was genuinely altered and bettered by the sheer power of film. He soon grows up with a better method of communication with his family, forming very personal relationships with other people including his girlfriend Emily, and making large steps towards adulthood and independence, and what Williams is able to show through his direction is how self-assured Owen has become, primarily thanks to the many colourful characters that Disney has introduced over the years. This culminates in a fantastic animated segment based on a story that Owen himself came up with that featured many of the classic Disney sidekicks like Baloo, Iago, Sebastian, Timon and others, which for me – a sucker for both fantasy stories and Avengers-style crossovers – was an absolute pleasure to watch, as not only did it have some great animation but it also hit firmly on the head what the inner mind of a young autistic man with a love of films would look like. It is powerful stuff, so much so that you may find yourself forming a mild lump in your throat as you watch (though if you form one without an emotional attachment to this film, you might want to get that checked out). Life, Animated is already a wonderful film that is extremely well-made, insightful, and made with such love for the main subject, but it transcends into an other-worldly experience for someone like me, who has a very similar background to Owen albeit not quite as severe. I consider my autism to be a superpower more than a disability (a phrase that I use very lightly, by the way), and it has helped me become more self-assured and confident than I was as a younger child, which in turn has enabled me to make many friends along the way with extraordinary ease, as well as make more sense of the world and its many, many faults. But like most people, I began my journey with Disney films which, to this day, I go back and re-watch every now and then, for both nostalgic purposes but also because they genuinely hold up as great family movies. Say whatever you want about the company’s evilly genius marketing and financial strategies, but their films have inspired generations of children with their uplifting and appropriate morals, most of which they are updating to this very day with films like Frozen and Moana. I will always have a special place in my heart for those films, because they were stepping stones towards my greater and wider love for film which is still going strong today, but Owen and his family owe them the far bigger gratitude because they actually helped this young boy cope with the world around him, at a time when it seemed hopeless to try and get through to him via any other method, because they had such strong values and life lessons that people still take their cues from, decades after Walt Disney himself began to work in Hollywood. If you want something that best celebrates the sheer power of film, then Life, Animated is a life worth living. 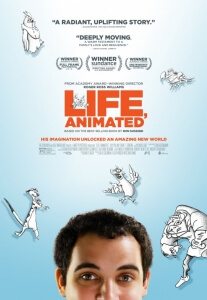 Life, Animated tells the extraordinary story of how young autistic man Owen Suskind learned to communicate through the power of Disney films, and it tells it through a powerful piece of filmmaking that brilliantly highlights the creative autistic mind as well as celebrates how film can help us all interact with each other through its strong positive messages and engaging sense of imagination.